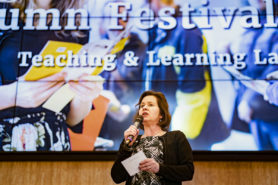 For everyone involved in improving secondary and higher education: put the TLL Autumn Festival 2019 in your agenda. The Autumn Festival will take place on Thursday afternoon, November 21, 2019, on the campus of Utrecht University. More information about the program will be announced later in the spring. Do you want to be kept informed? Let us know via teachinglearninglab@uu.nl or subscribe to our newsletter. See an impression of the Autumn Festival 2018.